South Gallia senior Curtis Haner (5) leaps for a rebound during the first half of Tuesday night’s TVC Hocking boys basketball contest against Eastern in Mercerville, Ohio. South Gallia junior Eli Ellis (10) releases a shot attempt during the second half of Tuesday night’s TVC Hocking boys basketball contest against Eastern in Mercerville, Ohio. MERCERVILLE, Ohio — They used to be known as the Runnin’ Rebels. Tuesday night, the Rebels just simply went on a run. 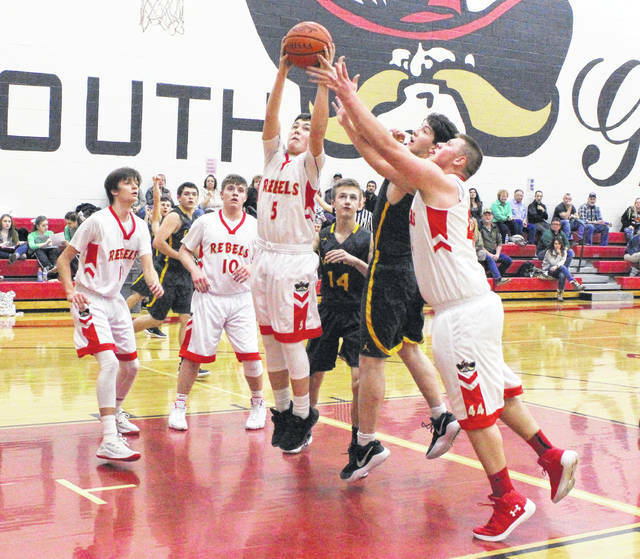 The South Gallia boys basketball team shot 53 percent from the field and used a 13-0 surge over the final 4:34 of the opening quarter to cruise to a 57-36 victory over visiting Eastern in a Tri-Valley Conference Hocking Division contest in Gallia County. 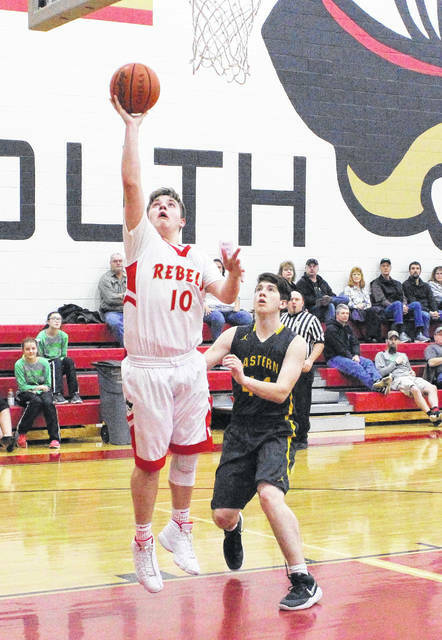 The Rebels (5-10, 3-6 TVC Hocking) hit six of their first seven shot attempts — including a trio of three-pointers — as the hosts stormed out to a 17-6 first quarter advantage. The Eagles (5-9, 2-8) were never closer than seven points the rest of the way and trailed by as many as 17 points in the first half before entering the break facing a 33-18 deficit. The Red and Gold led by double digits the rest of the night and took their largest lead at 55-33 with 3:16 left in regulation. The Green and White were never closer than a dozen points (33-21) over the final 16 minutes of regulation. South Gallia has now won four of its last five decisions, which includes three consecutive TVC Hocking Division victories. The Rebels also salvaged a season split with Eastern after dropping a 64-43 decision at the Eagles’ Nest back on Dec. 19, 2017. The 42-point swing in the rematch is the second largest turnaround for South Gallia over the last two weeks. 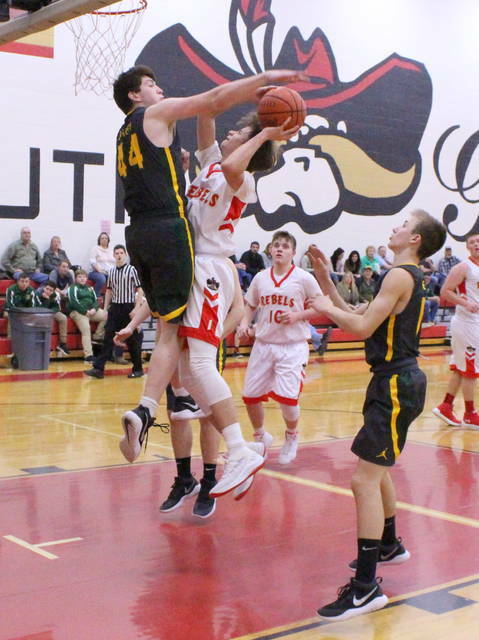 The Red and Gold made a 48-point improvement against Southern and a 12-point jump against Federal Hocking while avenging losses from earlier in the season. The difference came down to defense, which was apparent in the final statistics. Eastern made only 4-of-17 shot attempts after halftime and shot 36 percent from the floor overall. The Rebels outrebounded the guests by a 19-18 margin and also forced a dozen turnovers in the first half. Afterwards, SGHS coach Kent Wolfe acknowledged that his troops have made real strides in the last month — but Tuesday night’s effort also resulted in a post-game smile that the first-year mentor didn’t try to hide. EHS coach Jeremy Hill looked a little shell-shocked following the game, but he was also impressed with the Rebels’ performance in the rematch. As the fifth-year mentor noted, his troops just ran into a buzz-saw. “All the credit goes to South Gallia and to Coach Wolfe tonight. Those kids wanted it more, they played hard and they came up with all of the hustle plays,” Hill said. “They shot the ball way better than they did the first time and they showed just how much they’ve grown as a group since that first game. Both teams started strong after each hit their first three shot attempts, but the timing of turnovers also dictated the early flow of the lead change. The Rebels opened up an early 4-0 edge, but the Eagles countered with six straight points for their only lead of the game with 5:04 remaining. Eastern missed its final five shot attempts of the first quarter and SGHS tied the game at six just 30 seconds later on a Curtis Haner basket — which started the 13-0 charge. Austin Stapleton gave SGHS a permanent lead with a trifecta at the 3:58 mark, the first of eight straight points by Stapleton over the next two minutes. Haner added a three-pointer at the 1:29 mark to complete the run for an 11-point cushion after eight minutes of play. Eastern — which went 0-for-8 from three-point range in the first half — made a small 4-0 run to close to within 17-10 with 6:27 remaining, but the hosts responded with an 8-0 run over the next three minutes for a 25-10 cushion. Both teams traded eight points apiece the rest of the way, giving SGHS a 15-point lead at the intermission. The Rebels made a 14-12 run in the third for a 47-30 edge, then ended regulation with a 10-6 run to wrap up the 21-point outcome. EHS did claim a 10-7 advantage on the offensive boards, but also committed 19 turnovers in the setback. The Rebels, conversely, made only 15 miscues in the game — with nine of those coming after the break. South Gallia connected on 20-of-38 field goal attempts, including a 6-of-14 effort from three-point range for 43 percent. The hosts were 11-of-14 at the free throw line for 79 percent. Braxton Hardy paced the hosts with a game-high 22 points, followed by Haner with 13 points and Stapleton with 10 markers. Bryce Nolan was next with six points, while Eli Ellis and Austin Day completed the winning tally with respective efforts of six and four points. Hardy led SGHS with seven rebounds and Ellis hauled in five caroms. Haner and Stapleton also grabbed three boards apiece. The Eagles went 13-of-36 from the floor, including a 1-of-11 effort from behind the arc for nine percent. The guests were also 9-of-13 at the charity stripe for 69 percent. Isiah Fish led the guests with 12 points, followed by Kaleb Hill with eight points and a team-best 10 rebounds. Colton Reynolds and Garrett Barringer were next with respective efforts of six and five points. Mason Dishong and Sharp Facemyer completed things with three and two markers. Facemyer hauled in three rebounds, while Reynolds and Barringer each grabbed two caroms. South Gallia hosted Miller on Wednesday and returns to action Friday when it travels to Mason, W.Va., on Friday for a TVC Hocking contest against Wahama at 7 p.m.
Eastern returns to play Friday when it hosts Miller in a TVC Hocking contest at 7 p.m.